Hockenheim/Zwenkau, Germany. March 3 2016. For its line of 100% plant-based “Brotzeit” spreads, Tartex uses specially designed PermaSafe® packaging by Sonoco. This solution combines maximum convenience and long shelf life with an eye-catching appearance at the point of sale (POS). 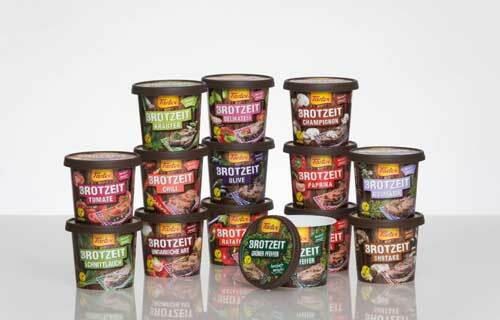 Allos Hof-Manufaktur produces its organic “Brotzeit” spreads at the company’s site in Freiburg im Breisgau, Germany. Packaged in plastic containers with a wooden barrel design, the spreads have been sold in health food stores since October 2015. Vegetarian and vegan lifestyles are a modern trend with a growing number of consumers looking for alternatives to meat on the supermarket shelves. A pioneer in vegan nutrition, Tartex introduced the first 100% plant-based spread more than 70 years ago. Today, the Tartex brand is produced by Allos Hof-Manufaktur, a subsidiary of the Wessanen Group based in the Netherlands. Specialising in healthy foods and sustainable food production, the company reported sales of EUR 433.5 million in 2015. Its German subsidiary, Allos Hof-Manufaktur, operates with around 250 employees at production sites in Drebber and in Freiburg im Breisgau, Germany where the Tartex “Brotzeit” spreads are produced. Allos Hof-Manufaktur introduced the new packaging for these products in October 2015. 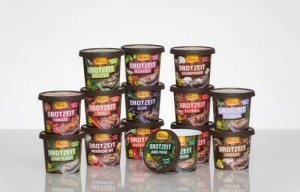 Sold across Germany in organic supermarkets and health food stores, “Brotzeit” spreads are currently available in 19 different varieties ranging from mushroom, to green pepper, and chives. Thirteen of the Tartex varieties are exported to other countries. Sonoco worked in close cooperation with Allos Hof-Manufaktur to develop a customised packaging solution based on the PermaSafe containers. The packaging for the plant-based alternative to spreadable meat products and cheeses is produced using in-mould labelling (IML) technology. Sonoco’s PermaSafe is a lightweight plastic packaging solution that guarantees long shelf life and offers attractive design options. It harnesses the advantages of plastic packaging for sterilized foods conventionally packaged in metal cans. Allos Hof-Manufaktur takes full advantage of the open design options available with IML packaging. The faceted shape of the new 125g containers replicates a tiny barrel made from wood slats. This structure enhances rigidity and reduces the amount of material required. Sonoco manufactures the plastic packaging at its production facility in Zwenkau near Leipzig, Germany. The injection-moulded label features a special matte finish developed by Sonoco for a natural, paper-like feel. These qualities underscore the naturalness of the product and give it an appetising appearance. With the IML process, the polypropylene containers are manufactured and labelled in a single operation. Key advantages include the container’s eye-catching appearance at the POS and the option of wrap-around labelling. IML is also beneficial in terms of recycling, because there is no need to separate materials. This is a compelling argument for customers at organic supermarkets and health food stores.